“J-Codes” and “medical specialty pharmacy” claims are going to be one of the top two procedure categories in terms of cost within your health plan. Knowing the amount of waste and abuse can give you insight into how you can develop strategies to drive more cost-effective utilization of the plan, and even enhance the benefits to the plan members for that efficient behavior. By identifying these specific issues within your plan and implementing targeted, value-based strategies to address them, you could eliminate tremendous costs without any adverse effects to your population. Join us for this HRCI* and SHRM** pre-approved, complimentary, one-hour webinar as our Senior Healthcare Data Analyst, Virak Nhek, talks about the financial perils and pitfalls of “J-Codes” within an employer-sponsored health plan, and how the power of data can unlock the secrets to managing its spend. **AP Benefit Advisors, LLC is recognized by SHRM to offer Professional Development Credits (PDCs) for SHRM-CP or SHRM-SCP. This program is valid for 1 PDC for the SHRM-CP or SHRM-SCP. For more information about certification or recertification, please visit shrmcertification.org. On March 28, 2019, Maryland’s legislature overrode Republican Governor Larry Hogan’s veto to raise the state’s minimum wage limit to $15.00 per hour from the current minimum wage of $10.10 per hour. This now makes them the sixth state to increase their minimum wage. The other states include California, Illinois, Massachusetts, New Jersey and New York. The new minimum wage will not take effect immediately, but rather on a yearly increase schedule. Large employers, with at least 15 employees, will start their increases on January 1, 2020, to reach the end goal of $15.00 by January 1, 2025. And for small employers, with fewer than 15 employees, will have an extra year to reach the new minimum wage. For businesses with employees under the age of 18 may pay them a minimum wage equal to 85% of the state’s minimum wage. Also under the new legislation, Commissioner of the Maryland Division of Labor and Industry (DLI) will adopt regulations requiring restaurant employers to provide wage statements to employees per pay period. These wage statements must show the employees’ hourly tip rate (derived from employer-paid cash wages) plus all reported tips (for tip credit hours) worked each workweek. By now you have probably seen or heard the news that the new rules governing association health plans (AHPs) have been struck down. Although true, this is not yet in effect. The judge in this case has remanded the final rule back to the DOL to consider whether two specific provisions of the rule can be severed from the rest of the regulations. The remainder of the rule is still valid. The final rule governing AHPs was created by the Department of Labor (DOL) to comply with an executive order issued by President Trump in October 2017. As directed by the executive order, the DOL was tasked with issuing regulations that would permit more employers (as well as sole proprietors) to form AHPs, thus expanding access to more affordable, high-quality health coverage. The DOL was specifically instructed to consider expanding the conditions that must be satisfied to form an AHP that is treated as a single plan under the Employee Retirement Income Security Act (ERISA). The final rule allows AHPs to offer coverage to some or all employers in a state, city, county or multi-state metro area, or to businesses in a common trade, industry, line of business or profession in any area, including nationwide. In addition, the final rule allows working owners without other employees, such as sole proprietors and other self-employed individuals, to join AHPs. The provision allowing working owners, without employees, to become members of an association. This ruling does not impact associations comprised of related employers, those in the same industry, as they will continue to be considered a “bona fide group” for AHP purposes. However, unrelated employers and business owners, without employees, that have already joined an AHP or are considering it, should review how they may be affected if this ruling stands. AssuredPartners will be closely monitoring all developments related to this ruling and will communicate any new information as soon as it is known. Should you have any questions or concerns, please contact your AP Benefit Advisors’ Account Executive or Account Manager. AP Benefit Advisors’ HRCI & SHRM Pre-approved Webinar | Medical Marijuana in the Workplace – Growing Like a Weed! As legal medical and recreational cannabis dispensaries expand across the United States, legal and decriminalized cannabis is expected to create more jobs in the country by 2020 than manufacturing, utilities or the government. While this is excellent news on many fronts, many states now have laws that legalize the use of marijuana for medical and recreational purposes making the jobs of Human Resources (HR) and other business professionals even more complicated with each passing day. These rules vary from state-to-state, and because they’re new, they haven’t been tested in our court system. To make matters more challenging, federal laws (where marijuana is still illegal) offer little guidance on the subject matter. In response to these new regulations, HR professionals and business leaders are charged with the responsibility of understanding the frequent changes in the laws relating to medical marijuana, reviewing their operating standards and updating their employment policies to account for these new regulations. However, it’s difficult to navigate through all the details and understand how the rules apply to your organization, and how much leniency you can allow and still maintain a safe work environment for all employees while protecting your bottom-line interests. There really is no one-size-fits-all approach to addressing the changing landscape of weed in the workplace. Review of medical marijuana and the impact on HR-related policies. What needs to change? Training – Where to begin? Group health plans must notify the Centers of Medicare and Medicaid Services (CMS) each year regarding whether the group health plan’s prescription drug coverage offered to Medicare Part D-eligible individuals is “creditable” or “non-creditable.” This notice must be done electronically by completing the online registration and disclosure form on the CMS website (view the form here). CMS has also published, on its website, guidance regarding the notice and the information required for the filing (view guidance here).The compliance date(s) for this annual disclosure is: (a) within 60 days after the beginning of the plan year (e.g., for a calendar year plan year, by March 1, 2019); (b) within 30 days after the termination of the plan’s prescription drug coverage; and (c) within 30 days of any change in the creditable coverage status of the prescription drug plan. HIPAA-covered benefit plans are required to report any breach during a calendar year involving less than 500 individuals to the Department of Health and Human Services (HHS) on an annual basis. Any such breach that occurred during the year must be reported to HHS by completing the disclosure form on the HHS website (submit a breach report here).The compliance date for this annual disclosure is within 60 days after the end of the calendar year (i.e., by March 1, 2019). Pursuant to the ACA, Applicable Large Employers (ALEs) and employers that self-insured their medical benefits must file information returns with the IRS and distribute health coverage information forms to their employees, via Form 1095-C or 1095-B, as applicable.The compliance date(s) for filing 2018 information returns with the IRS is February 28, 2019 for paper filers and April 1, 2019 for electronic filers. The deadline for employers to distribute 1095-C or 1095-B forms to their employees was once again extended. The deadline for providing individual statements to employees is March 4, 2019. On December 28, 2018, the IRS Office of the Chief Counsel released Informational Letter 2018-0033 to clarify when employers can request to recover mistaken HSA contributions. This letter should be used to interpret IRS Notice 2008-59, the previous guidance that served as a primary source of information on HSA issues and administrative procedures. The letter states that situations previously set forth in IRS Notice 2008-59 were not intended to be an exclusive list, and as long as the parties are put in the same position they would have been had the error not occurred, employers can request excess contributions be returned when they were a result of an administrative or process error. If you have additional questions or comments, please reach out to your Sales Executive or Account Manager to discuss them. Thank you. Reference Based Pricing is quite the buzz-phrase these days. Payers, consultants, employers, plan sponsors, vendors and providers are all talking about it, and all of them have strong opinions one way or the other as to how it can impact the healthcare delivery and financial landscape. Who is right? Who is wrong? Who is bending the truth? It is hard to say, other than to say that everyone is most likely a little right, everyone is most likely a little wrong, and everyone is likely bending the truth to fit their interests. What a cop-out answer! However, there is one area where it is far easier to get to the truth and understand where Reference Based Pricing, broadly adopted, can make a huge financial difference; outpatient infusion therapies. The HCPCS codes under the letter “J” are a breeding ground for waste and abuse, with a small subset of providers taking extreme liberties to pad their coffers. What makes infusion therapies so simple to quantify is the cost is basically 100% tied to the cost of the actual medication. Medication costs are easily tied to known and fairly fixed metrics such as AWP, WAC or ASP. In sparing you the details of all of the acronyms, the point is that there is little confusion as to the cost of medications coming from the manufacturers, while the cost of a Kidney transplant is far less transparent and simple to determine. An infusion therapy treatment cost formula should look something like Medication Cost per unit x Units of Medication + Administration Time x Hourly Cost for Administration. If I were to need 1 unit of Neulasta, the cost would be 1 Unit Neulasta ASP + 15 minutes x $2 per minute, or some variation thereof. We wouldn’t expect to see much variation, right? Wrong. Because many hospitals do not negotiate their cost for medications, such as Neulasta based on AWP (or any other fixed metric), those hospitals can essentially charge whatever they want…and they do. Below is a distribution graph for three years of claims data from the AssuredPartners’ book of business outlining the paid cost per unit of Neulasta and the associated variance based on where the medication was obtained. In a provider’s office, the average cost per unit was roughly $5,500, with a 68% chance of the cost falling between $3,500 and $7,600 per unit. In that same time period, the average cost per unit at an Outpatient Hospital Setting was $9,300 (a full 67% greater). To obtain the same 68% confidence interval, the range would be between $3,900 and $14,700 per unit. That two standard deviation spread is nearly $11,000 compared to the Office Setting’s range of $4,200. In simpler terms, in general, you will pay significantly more for this medication at an Outpatient Hospital setting AND you truly have no idea exactly how much it will cost your plan because the range of possible outcomes is so wide. Unlike a surgery, where it is far more challenging to benchmark the true cost of the service to the hospital, we know almost exactly how much the infusion of this medication should cost the hospital based on metrics such as AWP. This gets us back to Reference Based Pricing. How can we be sure that a reference based pricing model will deliver fair value for a service such as an infusion of Neulasta? When it comes to Medicare, most infusions are the same as ASP (Average Sale Price) plus roughly 6%. This means that for these drugs, Medicare is building in a 6% margin for providers over what they would spend to purchase the medication. Between GPOs and 340(b) alone, we know many hospitals can acquire these drugs for far less than the ASP. In that respect, we already know that Medicare alone is a reasonable reimbursement. If we were to have a contract at Medicare plus 25% as the basis for infusion reimbursements, we should be comfortable that the hospitals are being paid a reasonable and customary amount, no? 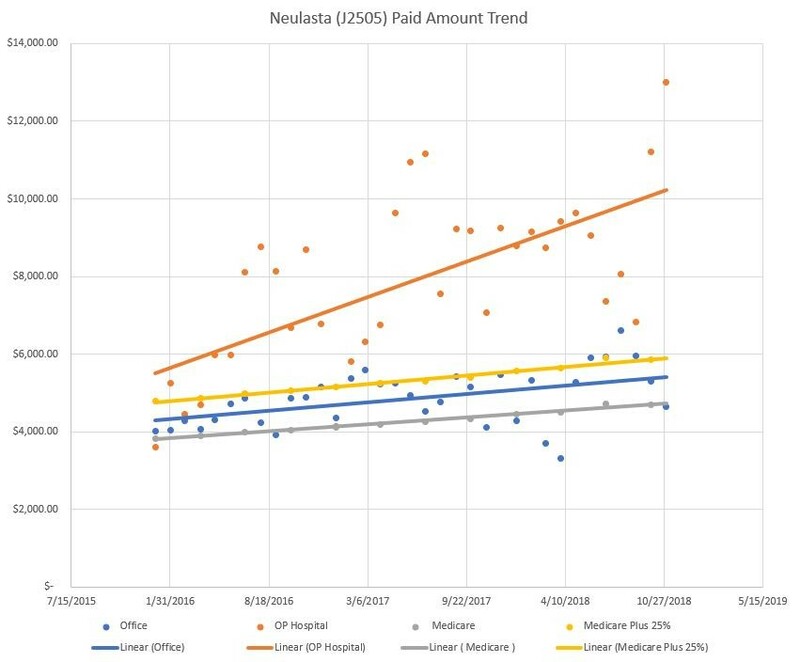 The blue line represents the average reimbursement trend for providers in an office setting for Neulasta over the past three years. The orange line represents the hospital reimbursements for the same thing. The gray line is Medicare reimbursements and the yellow shows Medicare plus 25%. We can notice a few trends here. First of all, the rate of growth in the hospital paid amounts is far greater than the Office providers and Medicare, which are essentially in lock-step. This means the disparity between the hospital paid amounts and the office paid amounts per unit is growing. Additionally, we can see that Medicare plus 25% is easily more than the commercial plans pay office providers, so why wouldn’t this be a reasonable and customary charge? 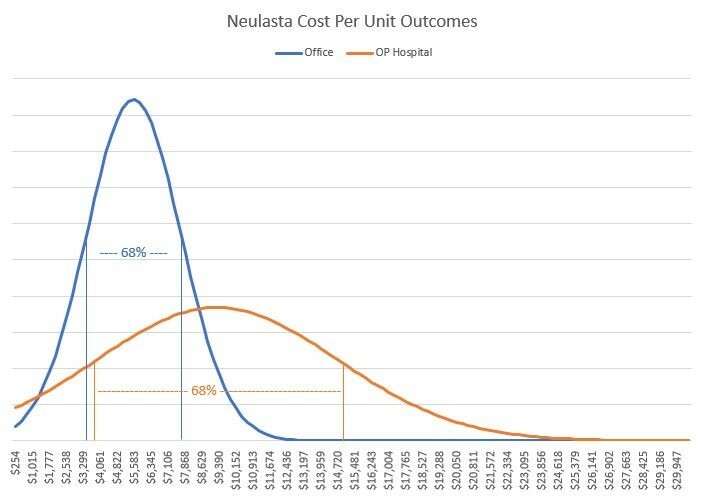 I would assume many office physicians would be more than happy to take a Medicare plus 25% reimbursement rate for Neulasta based on this data. A study in the February 2014 issue of the Journal of Allergy and Clinical Immunology would argue otherwise. In their study, they compared individuals with immunodeficiency and their rates of infections when receiving infusion therapies at home, in an infusion center and at an outpatient hospital. The outcomes showed that infection rates at the hospital were nearly 60% higher than the infusion centers, with home infusion being the safest (and probably the most comfortable). That study can be found here. Plenty of hospitals in our data aligned quite closely with the office providers, and it would be unfair of us to vilify all hospitals for this cost disparity. However, those hospitals would also stand to potentially benefit, or at the very least, break-even from a reference based pricing reimbursement for infusions. The only hospitals and health systems that would “lose” in this deal would be the ones that are using artificially high reimbursement rates for infusions to offset financial losses in other aspects of their care delivery model. Unfortunately for those hospitals, I do not want my clients to pay for the failures of the odd hospital’s business model. And while many of the insurance networks will avoid this type of confrontation with their partners hospitals and health systems, the more light we shed on this pernicious pricing structure, the more likely we are to be able to develop a solid solution to the problem. Perhaps this is a chance for the PBMs to be the hero (for a change)? So, change isn’t simply about embracing something unknown – it’s about giving up something old (and therefore good) for something new (and therefore not good). Before you can lead others, including your peers, coworkers and company leadership, through changes, you must prepare yourself and also be able to anticipate some of the predictable ways that people resist change. Please join us for this HRCI* and SHRM** pre-approved, complimentary, one-hour webinar as Kip Soteres, Founder/President of Soteres Consulting, focuses on personal resilience and provides practical ways for you to better manage change in your own life and within your company. At the same time, it will indirectly prepare you to be better prepared to deal with change resistance when you observe it in others and in your workplace. In my conversations with self-insured employer groups, I always drive home the significance of managing high dollar claimants; before, during and even after their event or ongoing treatment. As it stands today, in our book of business, the top one percent of users now account for nearly one third of all medical and pharmacy claims. Let that sink in for a moment. In a population of 1,000 people, a mere 10 of them will consume a full third of all healthcare dollars. Moving down the continuum, we are now at a point where the next four percent of members are now accounting for another third of all healthcare spending. We used to live by the 80-20 rule, but those days are long past us. Now we live by the Five – Two Thirds rule. Five percent of our population consumes two thirds of all healthcare dollars. In that population of 1,000 people, that means that 50 of them are eating up two thirds of our healthcare budget. What is just as shocking is what we now see on the inverse. Seventy percent of the population, or 700 people in our fictional group, now account for roughly five percent of all claims. Think of it; in a population of 1,000 people, 700 of them account for what is essentially a rounding error of healthcare consumption, while just 50 people are creating a vast majority of the healthcare claims. One has to wonder; why do we spend so much time focusing on that 70%? What is our goal within our population health programs as it pertains to that 70%? The “wellness” industry will tell us that our people will “graduate” from that 70% into our top 5% if left unchecked. Clearly, some will. After all, less than half our top claimants from this year will be our top claimants next year. But are they really going to go from spending virtually nothing on healthcare to costing over $100,000 a year just because they are not engaged in the wellness program? The short answer is, “no.” What’s more, I decided that data would be a good tool to back up my assumption. I took our sizable book of business and broke it down into 4 groups. Our top 1%, the next 4%, the 6th through 30th percent and our wonderful bottom 70% of all claimants. I utilized DxCG predictive modeling to identify what portion of the total claims dollars in each group was attributable to diabetes, cardio-pulmonary conditions, and cardiovascular conditions. The results are pretty staggering. I’ll spare you the numbers, but suffice it to say, it doesn’t seem to the naked eye that these popular targets for traditional wellness programs are such a big deal. 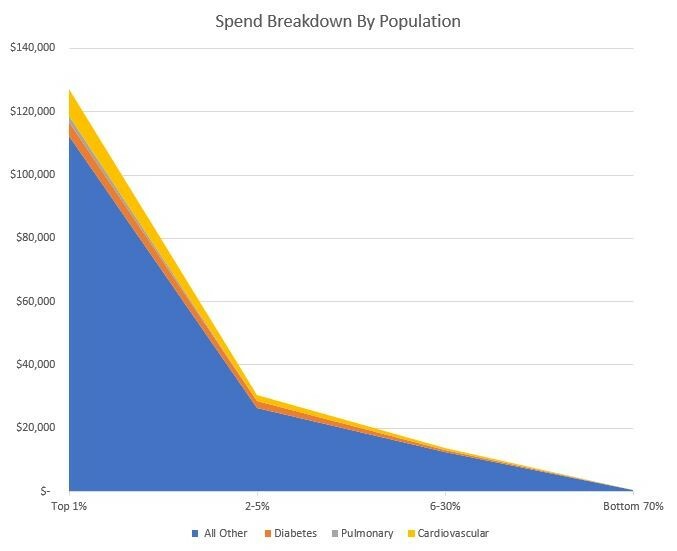 In fact, in our entire population, Diabetes accounts for 5.2% of spend, while Heart Health accounts for 6% of spend. Don’t get me wrong; 11.2% of plan spend is a good chunk, but how much of that can we expect to eliminate? Are we eliminating diabetes and heart disease entirely? Doubtful. I think even a great program could, at best, cut that number by a third. We’re talking maybe a 4% savings, and that’s under the best of circumstances. I know what you will say…Diabetes and Heart Disease lead to other comorbidities and it is all part of a continuum. I agree. Diabetes and Heart Disease create higher risk, and higher risk means higher spend. But to what degree? When I looked at the top 1% and parsed out the 88% of claims that were not heart disease or diabetes, I found some very interesting things: all types of cancer, chronic back/neck issues, congenital diseases, renal failure, shock trauma, childbirth complications, and substance abuse. Just as interesting, most of the largest claims would not be considered “preventable.” Certainly not by “wellness” standards. How do you prevent Lymphoma? How do you prevent a premature childbirth? How do you prevent Hemophilia, Rheumatoid Arthritis, Crohn’s, Muscular Dystrophy, Multiple Sclerosis or Cystic Fibrosis? Certainly with some of these large items, such as cancer, promoting appropriate screenings and early detection is key. And yes, things like renal failure and osteoarthritis can be the result of lifestyle behaviors, but we are talking about decades of behaviors that cannot be changed in a three-year period because of biometric screenings and a walking challenge. I am not saying that wellness programs are a waste of time. And I am not saying not to focus on diabetes or heart conditions as part of a population health management program. What I am saying, is that you should fully understand what parts of your population and risk profile are really driving the bus when it comes to your largest claimants, both now and down the road. If you can manage that top 5% more efficiently, regardless of what they have going on, that’s where you are going to make a dent in your spend. And a one-size-fits-all solution will not get to the heart of the issues affecting your specific group.